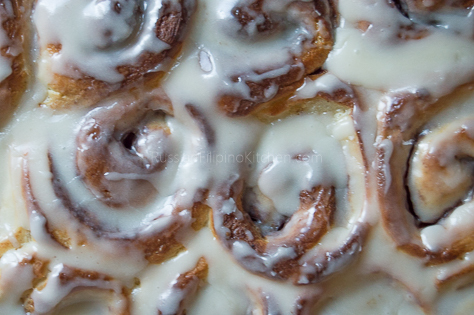 Think cinnamon rolls and imagine soft, moist, and deliciousness in every bite. That’s exactly how I want it and this recipe promises that. 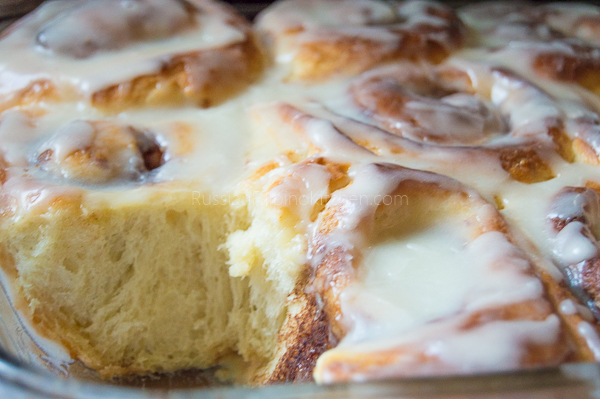 I wouldn’t say it’s the best cinnamon rolls in the world, but one of the best you will ever try. 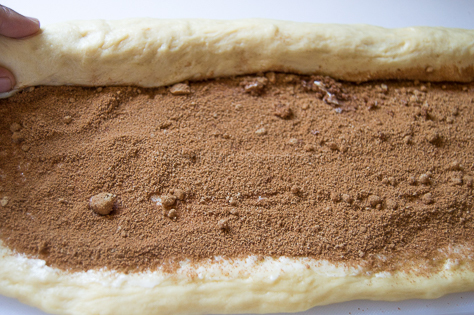 The secret is in the dough; it has to be soft and elastic. You have to knead it well and give it ample time to rise. I also learned that pouring some heavy cream to the rolls prior to baking makes it extra smooth and adds more flavor to the bread. But more on the and steps later. When I first learned baking bread, I was determined to conquer my fear of yeast and to understand the science and process of good bread making. From where I came from (Philippines), bread is not a staple in our diet, therefore I wasn’t familiar nor trained in baking breads. We mainly eat rice with almost anything, just like many countries in Asia. After I got married, my diet slightly changed as my husband regularly consumed bread and potatoes. Despite being a rice-loving gal, I adapted to some of my partner’s food choices including eating bread with soup, stews, meats, salads, and having sandwiches every now and then. Obviously, he grew up eating bread so we always have bread at home. This motivated me to learn how to bake especially breads because homemade baked goods are made with love, they’re fresh ( I love the smell of fresh loaves of bread straight out of the oven), and also preservative-free. 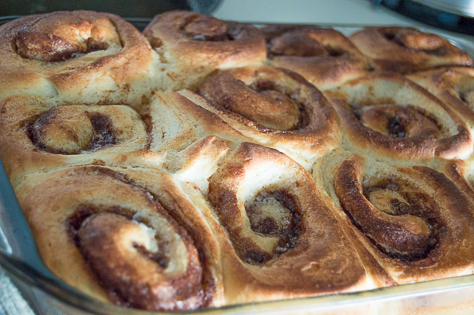 So back to this cinnamon rolls recipe. 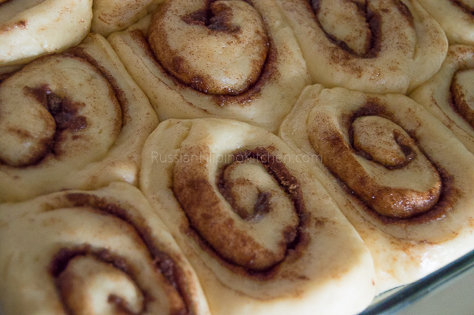 The secret to making soft cinnamon rolls is in the dough. It has to have the right balance of ingredients but most importantly, it has to be kneaded properly and giving ample time to rise. It’s much easier to use a stand mixer so you can just let the machine do the kneading ( I do it sometimes), but I prefer kneading by hand mostly ’cause you know in the old days people use their hands to knead and that’s an art form that is slowly disappearing. I’m old school, but that’s just me. If using a stand mixer with dough hook attachment is your choice, go for it. 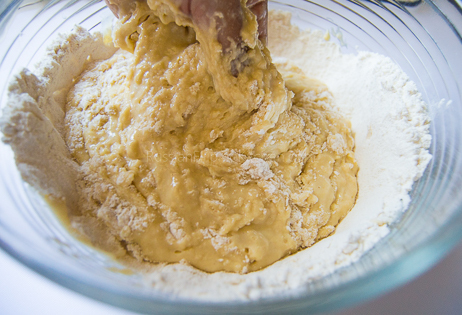 Just remember to slowly add the flour (1/2 cup increments) into the bowl and go at a mixing speed of 3 or 4. Take note also that the recipe specifies up to 4 cups of flour, but you don’t have to use all of them. As soon as the dough is elastic and doesn’t stick to the mixing bowl, your fingers, or the kneading surface anymore, then it’s done. I usually use only 3 1/2 cups total (that includes dusting). But then, you have to consider that humidity affects the dough as well, so if you live in a hot, humid area, adjust measurements accordingly. In this recipe, I poured some heavy cream on the rolls prior to baking. 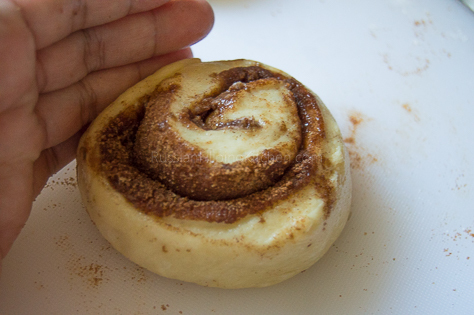 I’ve adapted this technique from other recipes I saw for cinnamon rolls, but it’s not necessary. 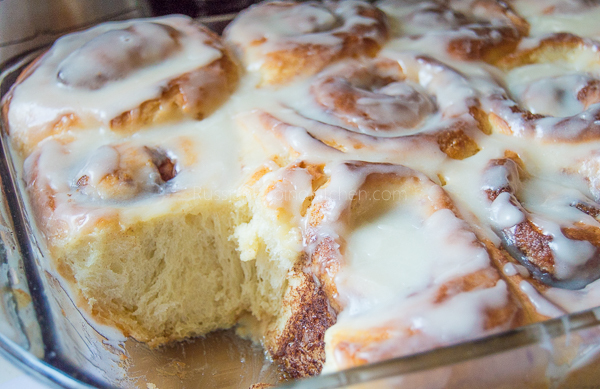 You can still have soft cinnamon rolls even without it. 1. 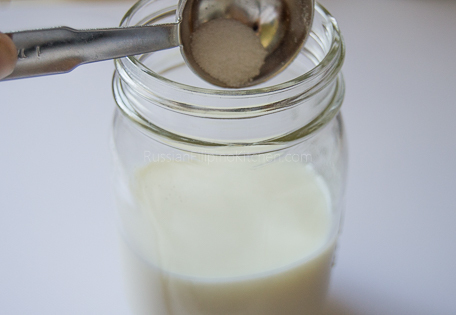 In a microwave-safe container, mix milk and 1 tbsp white sugar. Microwave on high for 1 to 1/2 minutes until the milk mixture is warm to the touch (between 110ºF-115ºF). If you have a kitchen thermometer, use it to get accurate reading. Since microwave models vary, temperature and heating times also differ. Use common sense in heating the milk and watch the temperature closely. Too hot or you’ll kill the yeast when added. However, if you heat it up too high, let it rest on the counter for a couple minutes till it cools down a little or soak the bottom of the container in cold water. If you don’t have microwave oven, use a small sauce pan or pot and warm the milk over low heat on the stove, stirring constantly. 2. Add the yeast into the milk mixture and stir to dissolve. Let it sit undisturbed until it gets frothy or bubbly, about 10 minutes. This process is called proofing the yeast or making sure the yeast is alive and ready to bake with. If your mixture doesn’t get bubbly after some time, it means the yeast is dead and it’s no good to use (either because it’s old or the liquid used is too hot they die). 3. 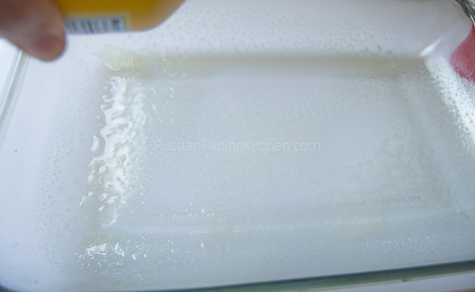 Melt butter in a sauce pan or in the microwave. Make sure it’s not too hot because you will mix it with the beaten eggs. If it’s too hot, it will cook the eggs. What I do is place the butter in a microwave-safe dish, microwave on high for 30 seconds or just until the butter melts slightly and just continue melting by stirring it with a fork. After this is done, crack eggs in a small bowl and beat lightly with a whisk or fork, then add the butter and mix until well-combined. Set aside. 4. 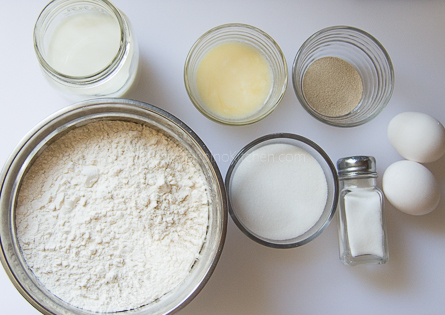 In a large mixing bowl, combine 3 cups of bread flour, salt, and the remaining white sugar. Leave 1 cup for adding later on when kneading. Whisk to combine. 5. 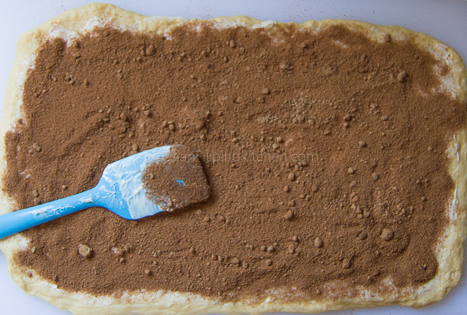 Using a spatula, make a hole in the center of the flour. 6. Pour in the yeast mixture and egg-butter mixture as well. 7. Slowly combine liquid mixture with dry ingredients by stirring spatula in a circular motion. 8. If you find using a spatula a bit inconvenient (like I do), go ahead and use your hands. With your fingers, mix slowly and gently until everything is incorporated. 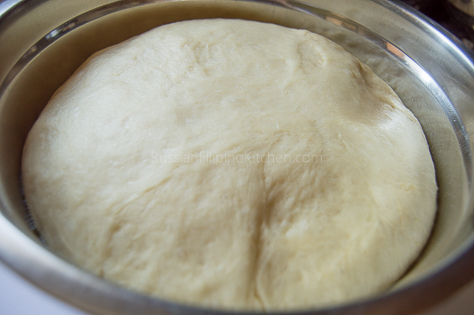 You’ll know the dough is ready to be kneaded when it starts pulling away from the sides of the bowl like shown below. 9. Sprinkle a little bit of flour (Remember the 1 cup flour left? Use that.) 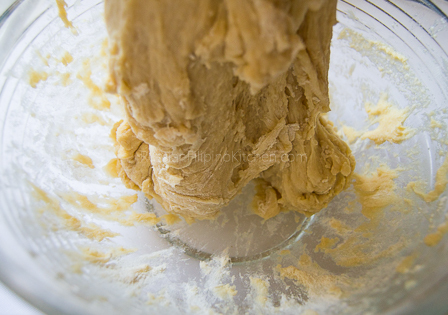 onto a flat, clean surface and knead your dough until smooth, elastic, and no longer sticks to your fingers. 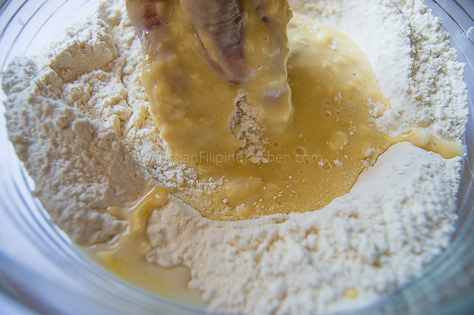 To knead, press the heels of your hands into the dough, pushing it slightly forwards. 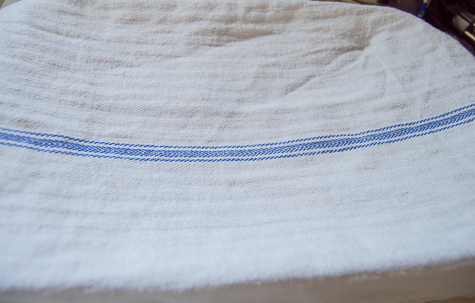 Then fold it in half and press forward flat again using the heels of your hands. Repeat until dough is soft and elastic. 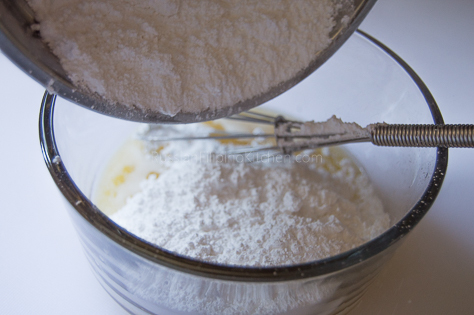 Add more flour if it gets sticky, but don’t overdo it.Remember, you don’t have to use all the flour and the dough should be soft to touch and a bit stretchy. Here’s a video on how to knead by hand. 10. 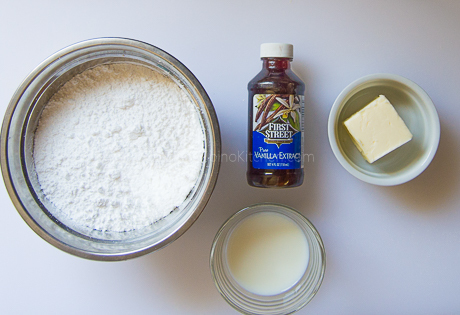 Form the dough into a ball and grease a large mixing bowl with cooking spray, vegetable oil, or butter. 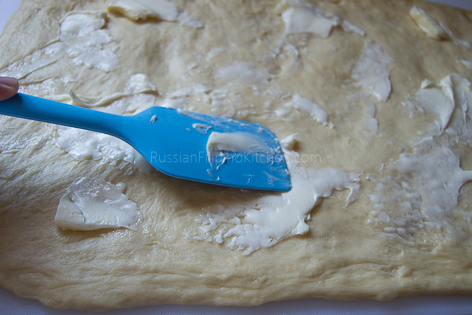 Place the dough into the bowl, turning once to coat the dough with oil. 11. 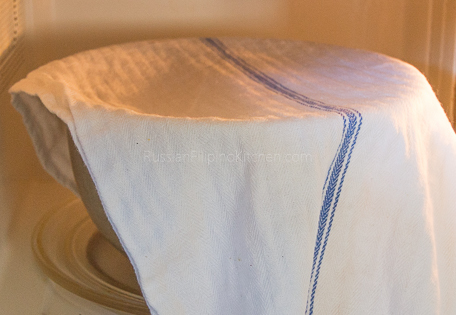 Cover bowl with a towel or plastic cling wrap and place in a warm spot in your kitchen to allow the dough to rise. My favorite place to proof the dough is inside the microwave. I microwaved half a cup of water in a glass dish for one minute then remove it, place the bowl with the dough inside, and let the tip of the kitchen towel that covers the dough go between the microwave door. The towel prevents the door from closing all the way, thereby leaving the microwave light on. The light gives off heat warm enough to make the dough rise. Try it. It works like a charm for me! Anyway, let the dough rise till doubled in size, for about 1 1/2 hours. 12. 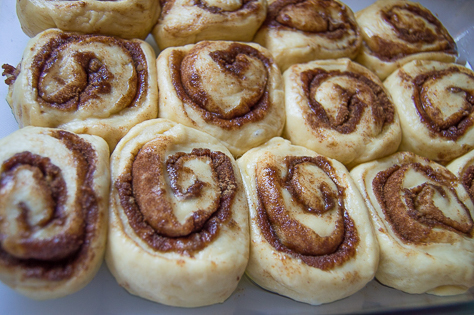 Meanwhile, prepare the cinnamon roll filling. 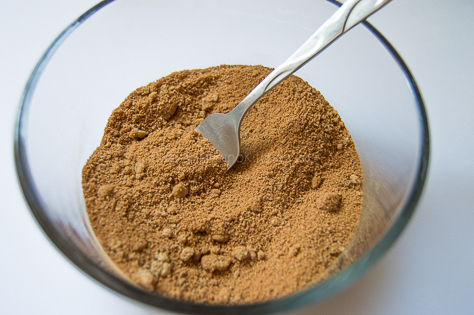 In a medium bowl, mix together brown sugar and ground cinnamon. Set aside. 13. Prepare the baking dish/pan as well by greasing with oil or butter. Set aside until ready to use. 14. 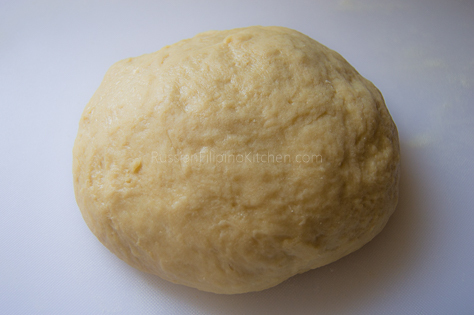 After the dough has doubled in size, punch down to deflate. 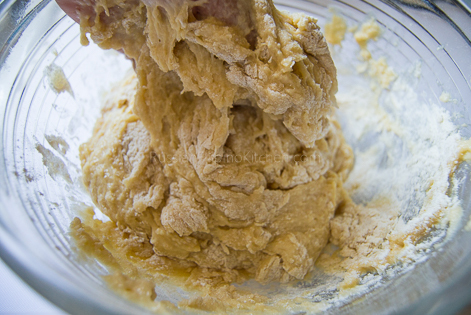 Punching the dough removes excess gas (carbon dioxide) leading to smaller and even air bubbles within making it easier to shape and form into portions. 15. 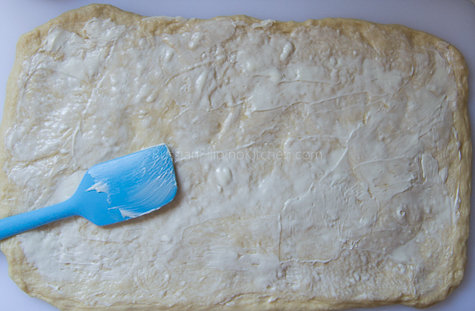 Place dough onto a clean, flat surface (no more adding flour at this point). Shape into an oval, and using a rolling pin or just your palms, press down flat and form a rectangle, about 18 x 12 inches. 16. Brush softened butter on top. 17. 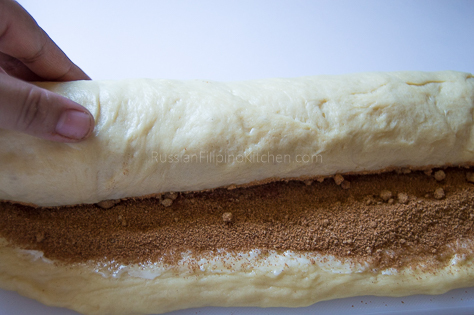 Then sprinkle evenly with the sugar-cinnamon mixture. 18. 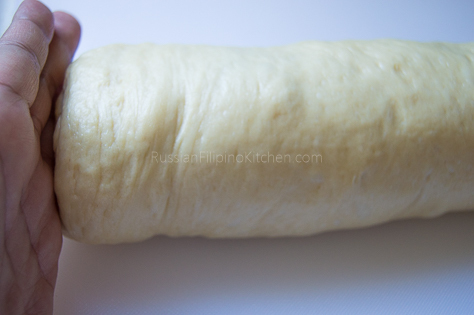 Start rolling dough from the opposite end going towards you, tightening the roll as you go. 19. Seal the roll by pinching the edges together, as shown below. 20. Place your palms on both ends of the roll to flatten it and to make uniform size rolls when cut. 21. 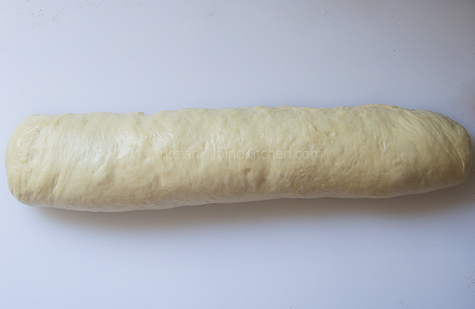 Use a very sharp knife and cut the dough into 12 rolls, 1-1/2 inches thick. I use a serrated knife here, but sometimes I also used unflavored dental floss or even regular thread for sewing to make cutting easier. 22. Reshape rolls when needed. 23. Arrange into prepared baking dish, cover with a kitchen towel and allow to rise a second time in a warm, draft-free place in your kitchen. During warmer months, I usually just leave it on the counter. During colder season, I placed it on top of the stove preheated to 350ºF for 10 minutes then turned off. I also leave the kitchen hood light on. 24. Let the rolls proof for another hour until doubled in size (they should look puffy). 25. Preheat oven to 350ºF. Once it’s ready, pour heavy whipping cream on top of cinnamon rolls, distributing evenly. This will make the rolls extra soft and delicious. 26. Bake in pre-heated oven for 25-30 minutes until the crusts turns golden brown. Remove from oven and prepare the glaze. 27. To make the glaze, melt butter (either in microwave or stove top). 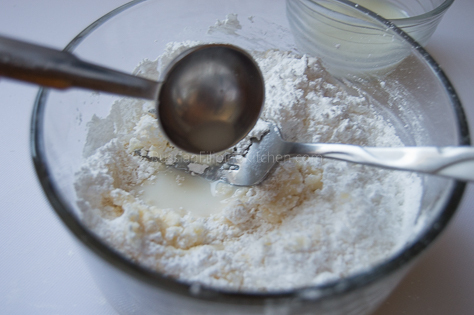 In a small mixing bowl, combine melted butter, powdered sugar, and milk. 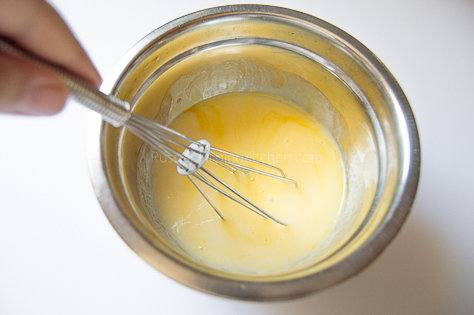 Whisk until mixture is smooth and there are no visible lumps of sugar. Note: You can adjust the thickness of your glaze, by adding more milk (by the teaspoon) to thin it out or add more powdered sugar to make it thicker. 28. 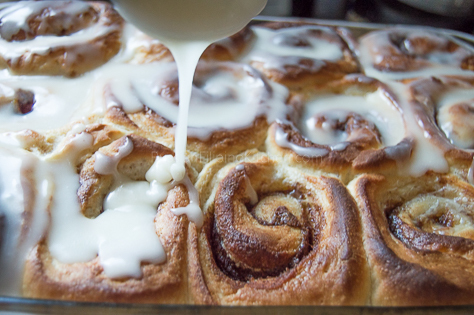 Drizzle glaze on top of warm cinnamon rolls. 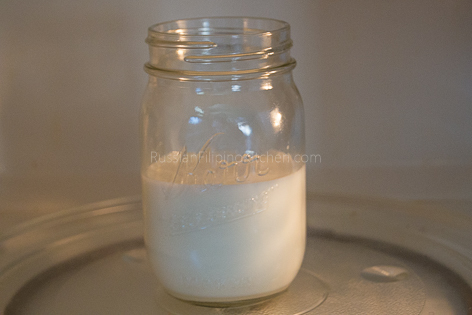 In a microwave-safe container, mix milk and 1 tbsp white sugar. Microwave on high for 1 to ½ minutes until the milk mixture is warm to the touch (between 110ºF-115ºF). If you have a kitchen thermometer, use it to get accurate reading. Since microwave models vary, temperature and heating times also differ. Use common sense in heating the milk and watch the temperature closely. Too hot or you'll kill the yeast when added. However, if you heat it up too high, let it rest on the counter for a couple minutes till it cools down a little or soak the bottom of the container in cold water. If you don't have microwave oven, use a small sauce pan or pot and warm the milk over low heat on the stove, stirring constantly. 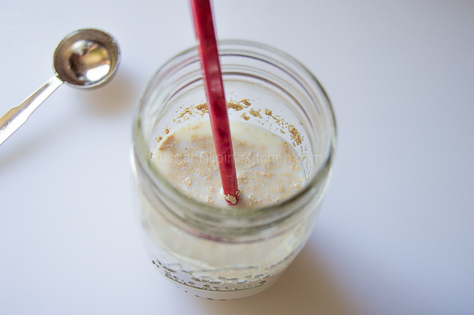 Add the yeast into the milk mixture and stir to dissolve. Let it sit undisturbed until it gets frothy or bubbly, about 10 minutes. This process is called proofing the yeast or making sure the yeast is alive and ready to bake with. If your mixture doesn't get bubbly after some time, it means the yeast is dead and it's no good to use (either because it's old or the liquid used is too hot they die). Melt butter in a sauce pan or in the microwave. Make sure it's not too hot because you will mix it with the beaten eggs. If it's too hot, it will cook the eggs. 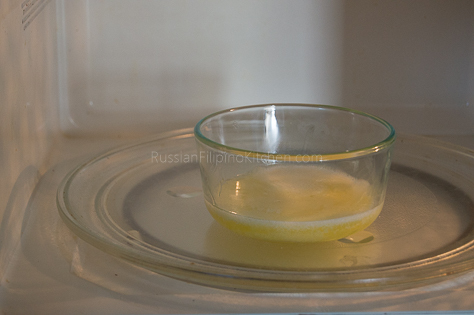 What I do is place the butter in a microwave-safe dish, microwave on high for 30 seconds or just until the butter melts slightly and just continue melting by stirring it with a fork. After this is done, crack eggs in a small bowl and beat lightly with a whisk or fork, then add the butter and mix until well-combined. Set aside. 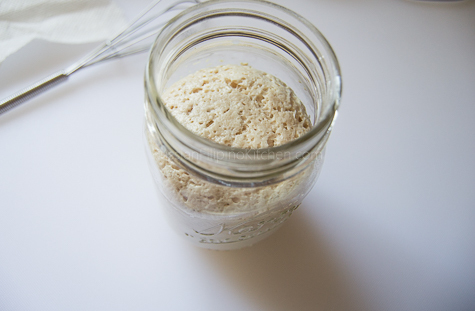 In a large mixing bowl, combine 3 cups of bread flour, salt, and the remaining white sugar. Leave 1 cup for adding later on when kneading. Whisk to combine. 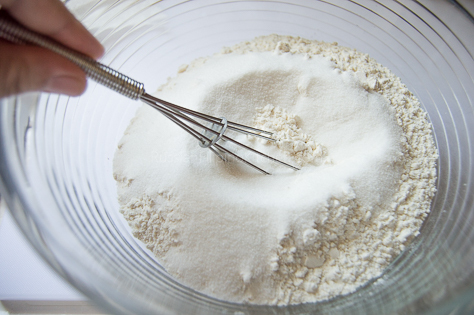 Using a spatula, make a hole in the center of the flour. 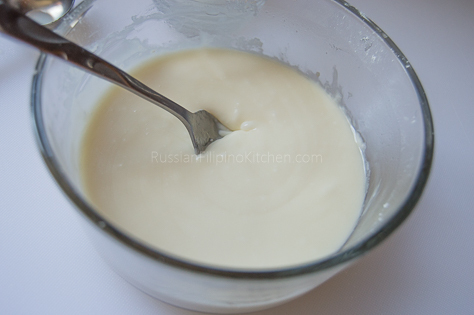 Pour in the yeast mixture and egg-butter mixture as well. Slowly combine liquid mixture with dry ingredients by stirring spatula in a circular motion. If you find using a spatula a bit inconvenient (like I do), go ahead and use your hands. With your fingers, mix slowly and gently until everything is incorporated. 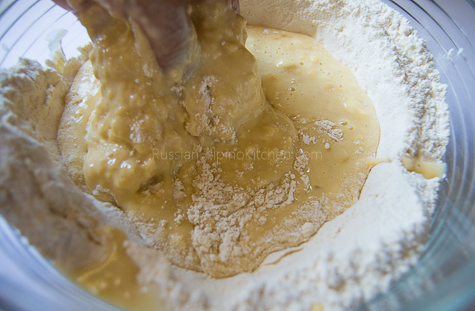 You'll know the dough is ready to be kneaded when it starts pulling away from the sides of the bowl like shown below. Sprinkle a little bit of flour (Remember the 1 cup flour left? Use that.) 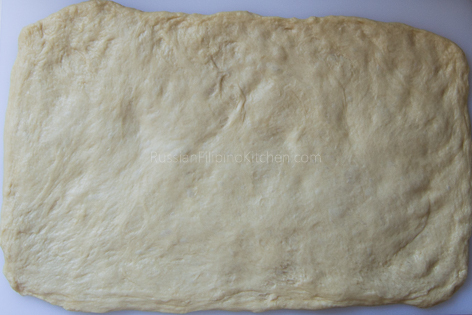 onto a flat, clean surface and knead your dough until smooth, elastic, and no longer sticks to your fingers. 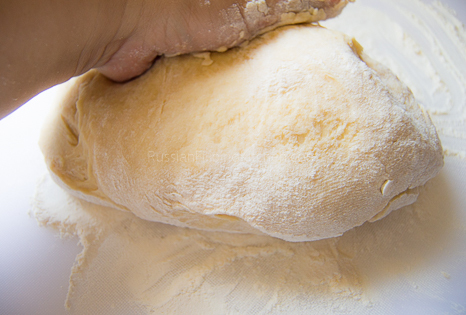 To knead, press the heels of your hands into the dough, pushing it slightly forwards. Then fold it in half and press forward flat again using the heels of your hands. Repeat until dough is soft and elastic. 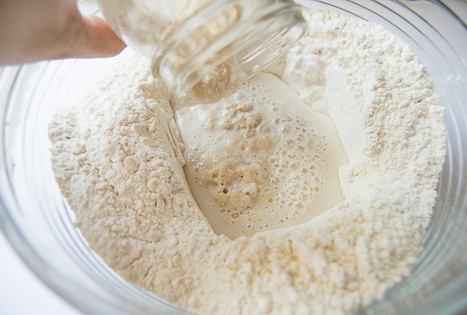 Add more flour if it gets sticky, but don’t overdo it.Remember, you don't have to use all the flour and the dough should be soft to touch and a bit stretchy. 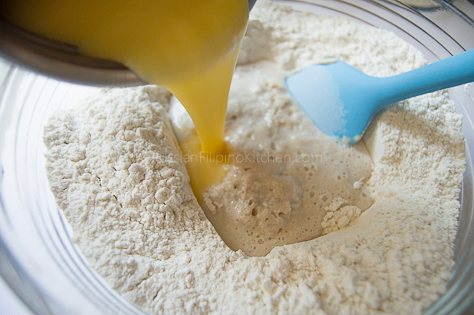 Form the dough into a ball and grease a large mixing bowl with cooking spray, vegetable oil, or butter. 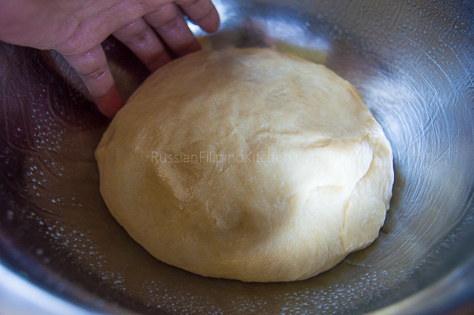 Place the dough into the bowl, turning once to coat the dough with oil. Cover bowl with a towel or plastic cling wrap and place in a warm spot in your kitchen to allow the dough to rise. My favorite place to proof the dough is inside the microwave. I microwaved half a cup of water in a glass dish for one minute then remove it, place the bowl with the dough inside, and let the tip of the kitchen towel that covers the dough go between the microwave door. The towel prevents the door from closing all the way, thereby leaving the microwave light on. The light gives off heat warm enough to make the dough rise. Try it. It works like a charm for me! 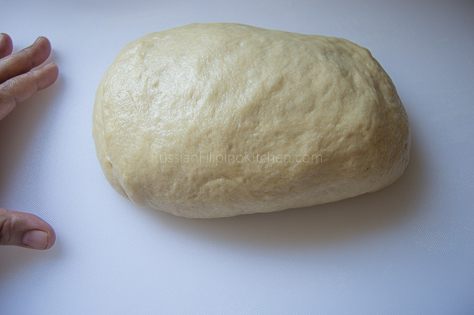 Anyway, let the dough rise till doubled in size, for about 1½ hours. 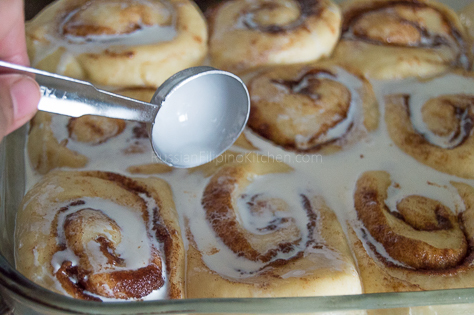 Meanwhile, prepare the cinnamon roll filling. 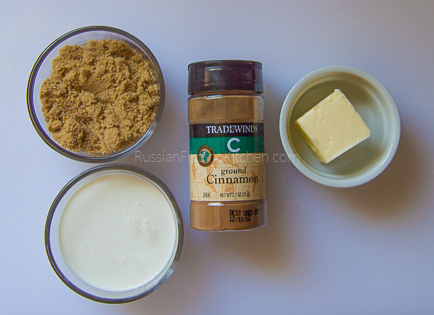 In a medium bowl, mix together brown sugar and ground cinnamon. Set aside. Prepare the baking dish/pan as well by greasing with oil or butter. Set aside until ready to use. 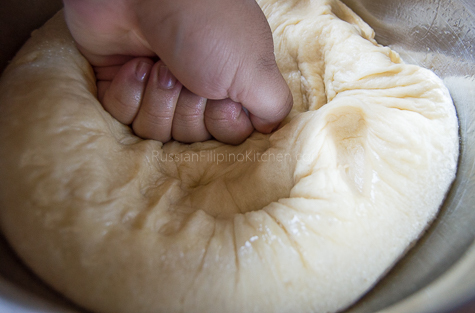 After the dough has doubled in size, punch down to deflate. 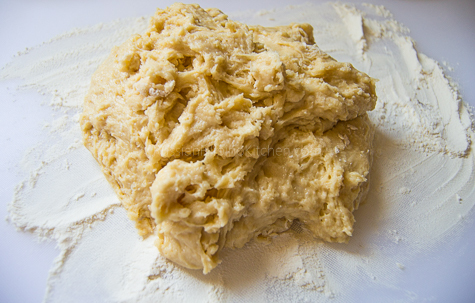 Punching the dough removes excess gas (carbon dioxide) leading to smaller and even air bubbles within making it easier to shape and form into portions. 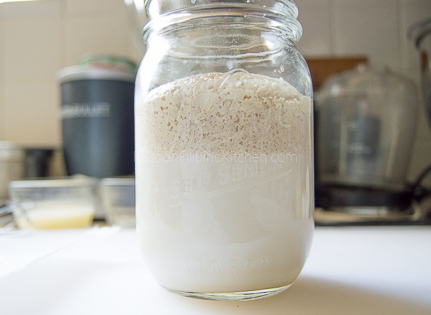 Place dough onto a clean, flat surface (no more adding flour at this point). Shape into an oval, and using a rolling pin or just your palms, press down flat and form a rectangle, about 18 x 12 inches. Brush softened butter on top. 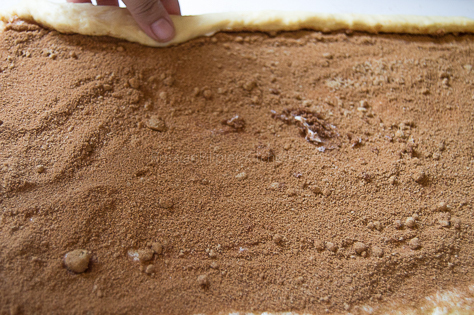 Then sprinkle evenly with the sugar-cinnamon mixture. 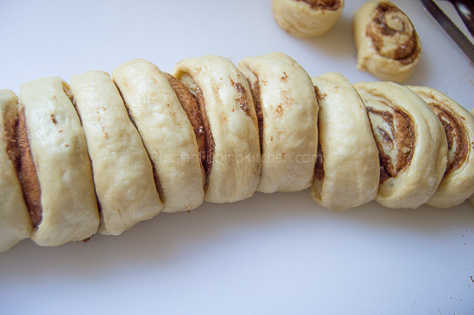 Start rolling dough from the opposite end going towards you, tightening the roll as you go. Seal the roll by pinching the edges together, as shown below. Place your palms on both ends of the roll to flatten it and to make uniform size rolls when cut. 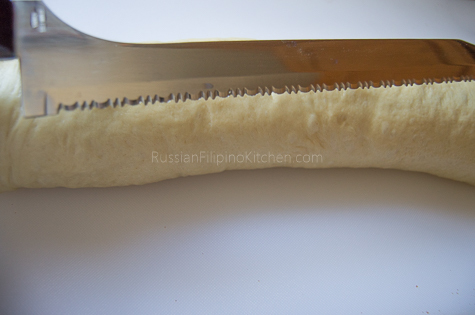 Use a very sharp knife and cut the dough into 12 rolls, 1-1/2 inches thick. I use a serrated knife here, but sometimes I also used unflavored dental floss or even regular thread for sewing to make cutting easier. Arrange into prepared baking dish, cover with a kitchen towel and allow to rise a second time in a warm, draft-free place in your kitchen. During warmer months, I usually just leave it on the counter. During colder season, I placed it on top of the stove preheated to 350ºF for 10 minutes then turned off. I also leave the kitchen hood light on. Let the rolls proof for another hour until doubled in size (they should look puffy). Preheat oven to 350ºF. Once it's ready, pour heavy whipping cream on top of cinnamon rolls, distributing evenly. This will make the rolls extra soft and delicious. Bake in pre-heated oven for 25-30 minutes until the crusts turns golden brown. Remove from oven and prepare the glaze. To make the glaze, melt butter (either in microwave or stove top). 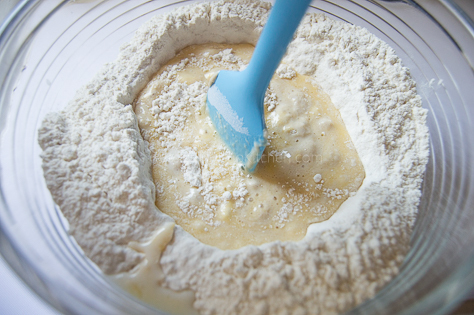 In a small mixing bowl, combine melted butter, powdered sugar, and milk. 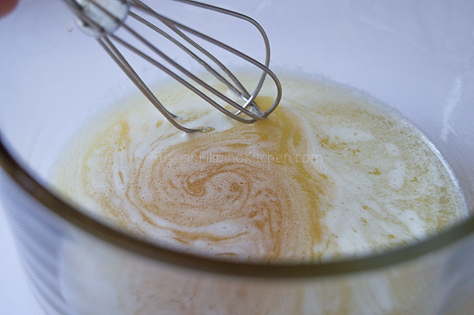 Whisk until mixture is smooth and there are no visible lumps of sugar. Note: You can adjust the thickness of your glaze, by adding more milk (by the teaspoon) to thin it out or add more powdered sugar to make it thicker. 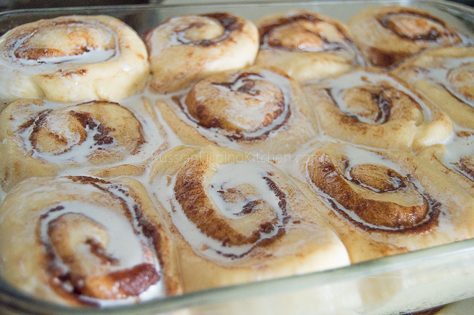 Drizzle glaze on top of warm cinnamon rolls. Hello Mia. I am so glad I stumbled upon your website. 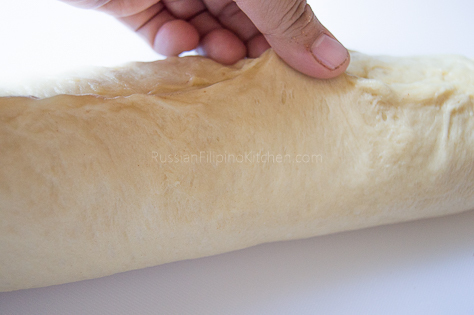 Been looking for a really soft pandesal and yours is a keeper. 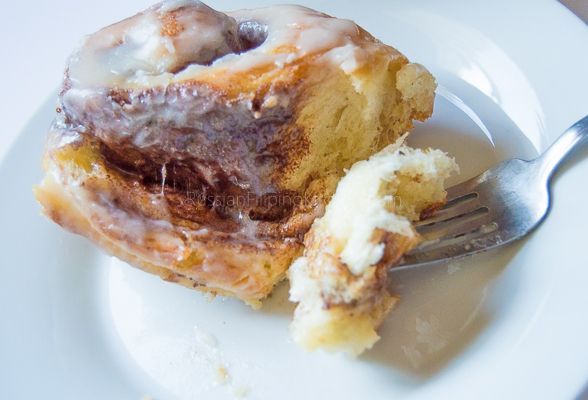 I have also tried the Cinnamon Rolls and omg it is really soft and melt in your mouth. Thank you very much for sharing your recipes. Can I use your cinnamon roll recipe to make an ensaymada or do you have a tried and tested recipe of it? Thank you very much in advance. God bless and more power to you.